Here at Mastercraft Upholstery we’re regularly asked to create made to measure headboards for our customers, allowing them to ensure the sizing and style of the headboard is just right for their requirements. Purchasing a bespoke headboard allows you to choose from hundreds of fabrics, ensuring you can get the style and look just how you want it. We stock an extensive range of fabric from our well known suppliers and can help you pick the perfect fabric. 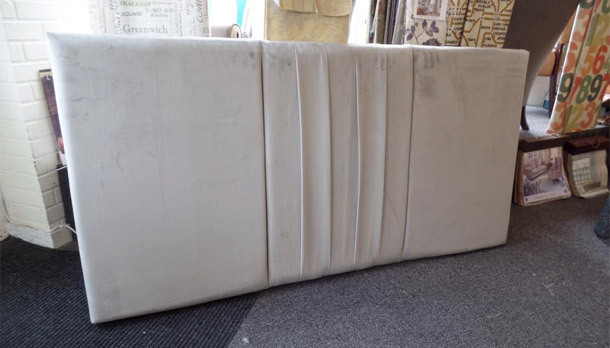 Headboards are usually fairly easy to transport and deliver, so we do tend to provide these for customers across the whole of the UK as well as in our local area. If you would like us to provide you with a quotation or have any questions, please request a quote or contact us.